If you’re familiar with Seminole history, there are a lot of things you may recognize immediately as essential to our mission: a piece of patchwork, a doll or basket, and perhaps a historic photograph or postcard. At the Museum we’re happy to see those, but we also love to uncover a piece of Seminole history and culture that we haven’t talked about in a public forum. It’s not always obvious if an object that’s offered to us is relevant to Seminole history, and we have to scratch our heads and think outside the box at times like this. This is what happened in 2017 when we were contacted by a Mr. Sigfried R. Second-Jumper, aka Siggy Jumper. Mr. Jumper told us he had a drum made by Thomas Storm Sr., and that it would be a great addition to our Museum. So we recognized this immediately as the type of drum used in western Native American drum circles. But a Seminole drum circle? We’d never heard of that. With Mr. Jumper’s help we learned that Cypress Prairie, the drum circle he participated in from 1998-2001, was a collaboration between Seminole and other Native people, and that helped us to understand that it was indeed an important part of the Seminole story. 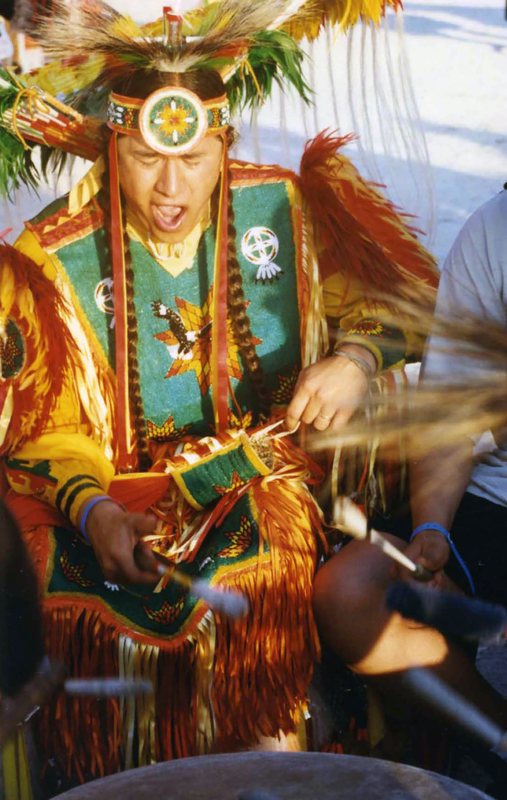 The Seminole Tribe of Florida has welcomed the traditions of other tribes for at least 100 years. Around the turn of the 19th century Seminole people became involved with tourist attractions that featured their own cultural traditions packaged in a way that tourists would appreciate and pay for. In turn, people working in those camps were exposed other forms of art that weren’t traditionally Seminole. So they adapted and took on some of those traditions. Some people say that things like totem poles need to be thought of differently, that they are not Seminole, because they originated on the West Coast of the United States. But in my opinion that’s a very narrow viewpoint. History doesn’t stop, and culture changes constantly. And why should Seminole artists have been exclusionary at that time, when they saw totem poles and admired them? After all, they helped Seminole people make money. Anything that helped Seminole people gain economic independence after a devastating century needs to be appreciated. Tribal fairs and pow wows are other venues through which Seminole people have long celebrated Native talent from far and wide. Whether it is fancy dancers from the Great Plains or fire dancers from Mexico, all these performance traditions show the pride and resilience of Native peoples who were disrespected, persecuted, subjugated, massacred and driven out of their homelands over a 300 hundred year period. So it seems natural that people would want to share the beauty that managed to survive with each other. Drum circles have also been a feature at Seminole events for many decades. Some of the pictures in our historic collection illustrate the healing power of musical traditions like this. Come see us at the Museum on Big Cypress! Objects from the Siggy R. Second-Jumper collection are on display until April 4th at the Ah-Tah-Thi-Ki Museum. In that gallery you can read about his extraordinary story and you can be inspired by the beautiful music that Cypress Prairie created. We will continue to collect stories like his that show the wealth and variety of Seminole life, so that we can do the best job possible to celebrate, preserve, and interpret Seminole culture and history. We need your help to make it happen. Just call at 863-902-1113 and ask for the Collections Division. Please contact us if you’re interested in helping tell the Tribe’s story!